Google Chrome users on Android might’ve noticed that when they over pull a webpage downwards it is automatically refreshed. This feature is useful when you want to refresh a webpage quickly. A major disadvantage of this is, if you enter any information on a webpage and it gets accidentally refreshed, the information vanishes too. Google has provided a way to disable this feature in the flags menu. Once disabled, overpulling a web page will not refresh it. Chrome flags contain set of features which are still in testing phase. They are not included in the stable build but are accessible in Flags menu. To disable ‘pull-to-refresh’, you have to visit Chrome://flags menu on your Chrome browser. This will open Chrome flags menu page which contains several features which are in test phase. On the page, manually search, “The pull-to-refresh effect Android”. You can also use ‘Find in page’ option for automatic searching by tapping on 3 dots on upper right corner of the screen .Tap on Find in page for automatic searching. 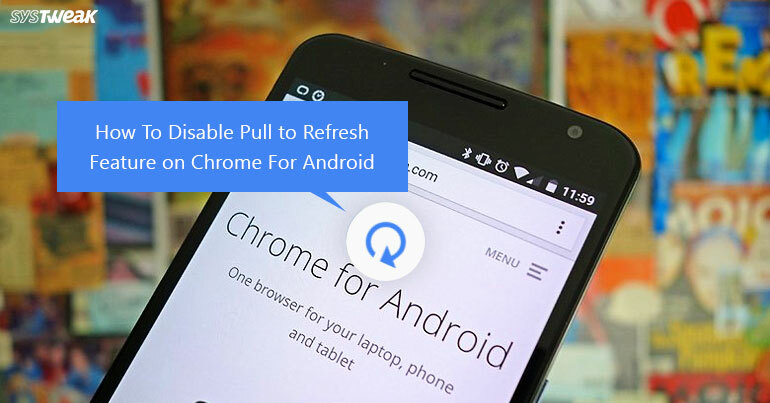 In “The pull-to-refresh effect Android” , click on Disable button. Select ‘Always’ and tap on RELAUNCH NOW button to disable pull-to-refresh feature. RELAUNCH NOW button will restart Chrome and apply the changes. Note: Sometimes you need to force close the Chrome browser to apply the changes. If you do not see the change, then force close the application and relaunch it again. This feature may not be useful for those who need to refresh the web pages regularly and do not use Chrome browser for filling any forms. If a user visits web pages which constantly need information to be entered then this feature can be disabled to get rid of annoying accidental webpage refresh. It is not necessary to disable this feature, however, if you are annoyed by the accidental page refreshes then you should disable pull to refresh feature.